GASTON COUNTY, N.C. (WBTV) - Yard work is something most everyone has to do, or at least have had to do in their life. But motorcyclist groups across the area are warning people about the consequences, however, that can come from that. Grass clippings are often blown or left in the road and can lead to serious injuries or even death for those that ride. “Just this past weekend, I have a friend that lives in West Virginia. He actually went down and passed away,” said Michelle Poovey, who has been riding for years. “I had a friend about 5 years ago, go down under grass and he didn’t make it,” said Bobby Meadows, who also rides motorcycles. WBTV met with more than 50 bikers in Gaston County who say when they hit grass in the road it is the equivalent of hitting black ice. “Because once you hit it, it is like ice you can’t control it and lose traction,” said Poovey. “You are going to go where the grass wants you to go, whether that is off the road into a tree, into a ditch, oncoming car, it doesn’t matter,” said David Poovey. Poovey went down one time because he hit grass in the road. Julie Head says she also almost crashed when she hit grass. There is a state law in North Carolina that says you can't place litter or debris in the roadway, however, that does not mention grass, specifically. The bylaw says the term "litter" shall not include nontoxic and biodegradable agricultural or garden products or supplies, including mulch, tree bark, and wood chips. That includes grass clippings. But your city could have a local ordinance that makes it Illegal. It all depends on where you live and how strictly it is enforced. “Law enforcement needs to get involved and this needs to get out to public. They need to be more aware,” said Meadows. Currently, the Concerned Bikers Association of Gaston County is working to get the law changed at a state level to specifically make blowing or placing grass into the road illegal. “It is long past due. Long past due,” said Jill Stillwell, the President of the CBA of Gaston County. For these bikers, riding is not just a form of transportation, it is a way of life. “It is the feeling that you get, it is like being free,” said Michelle Poovey. “When you are behind these handle bars, nothing else matters, you have no problems, no worries, everything just goes away,” said David Poovey. “Whatever we are on, we are moms, grandmas, grandpas, brothers, sisters, moms, dads,” said Head. 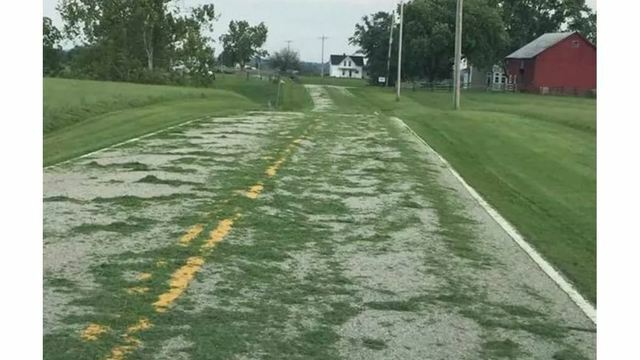 While the group hopes to make changes to the law, they also want to raise awareness so people stop blowing grass into the roadways. “It is just lack of knowledge. I do not think that they think about the seriousness of it and how devastating it can be,” said Meadows. If you are caught doing this, and your city or county has an ordinance against it, you could be charged with a misdemeanor and could face a fine.